House Speaker J.D. Mesnard told Capitol Media Services he sees no reason why purchases made by Arizonans on the Internet should be exempt from the state’s 5.6 percent sales tax while local brick-and-mortar retailers are forced to collect the levy. “We haven’t had the authority before now,” the Chandler Republican said. Prior to that, courts had said sales taxes could apply only to businesses with a physical “nexus” to a state, whether that meant having local retailers, offices or warehouses. That’s why Amazon in 2012 agreed to begin collecting sales taxes in Arizona after state revenue officials began proceedings against the company based on the fact it has “fulfillment centers” in the state. That deal settled the $53 million assessment against it that had been made by the state Department of Revenue. But Amazon does not collect taxes on sales made by its network of third-party retailers. Purchase from others with no clear links to the state, however, have gone untaxed because of that “nexus” rule — the one the Supreme Court threw out. How much is out there is unclear. In a report last year, before the court ruling, the federal Government Accountability Office estimated that state and local governments could pick up another $8 billion to $13 billion a year by taxing online sales. 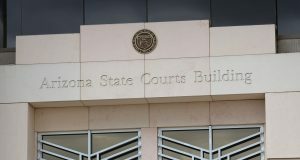 The agency’s predictions for Arizona, both at the state and local level, ranged from $190 million to $293 million a year, though some of that would go to cities and counties, both in the form of shared state revenues and their own local levies. “I have always been one to consider if we can lower taxes in one place and broaden the base is not bad idea,” Farnsworth said. “If we decided to add a tax, then we would want to reduce taxes somewhere else,” he said. The trick, said Farnsworth, is figuring out how to do that — and do it in a fair way. His preference: Cut income taxes. But Farnsworth said he’s divided as to whether that should reduce the corporate levy, which already has been cut by close to a third in the past decade, or trim individual income tax rates. “I have never advocated from the perspective of taking more from taxpayers,” he said. And Mesnard said that new — and unexpected — revenues provide opportunities to consider how to reform the overall tax structure of the state. “That’s a level that hasn’t been developed because, up until now, this really wasn’t a reality,” Mesnard said. Ugenti-Rita, who chairs the House Ways and Means Committee, said the state needs clarity on what is — and is not — taxable, saying that both the state Department of Revenue and individual cities have been less than forthcoming in providing details. She said if lawmakers don’t set down some clear rules, the courts will intercede. “It’s very much a hypothetical,” he said. “Having seen numerous estimates on these kinds of things over the years, it’s very difficult for us to know what kind of revenue we would actually see,” Scarpinato said. But he said that Ducey does have some philosophical touchstones on the question. “He doesn’t want Arizonans to pay more taxes,” Scarpinato said. “Any time we make a change, we want to do it through a prism of are we improving the overall tax code and making it simpler,” he said.